Spring is here and so are my allergies. Everything is blooming at once. I've been coughing my way through writing patterns and finishing up the Design Handout. The hat and mitten sections are finished and the sweater section is almost done...Hopefully, I can finish it this week. I reviewed lots of lessons this week. I am starting to get back lessons for the Finishing Course. I am enjoying the review process much more than I thought. When I was reviewing for the Masters Program, I dreaded getting a Level 2 box. They required so much more work than even Level 3. I came away from the process knowing that very few knitters know how to finish properly. I know the reviewers will be thrilled when they get my students' Level 2 work. I've been VERY impressed. This week the tip concerns seaming K2P2 ribbing. Mattress stitch is used to seam K2P2 ribbing. The problem is configuring the ribbing so that it can be seamed in such a way as to maintain the pattern. 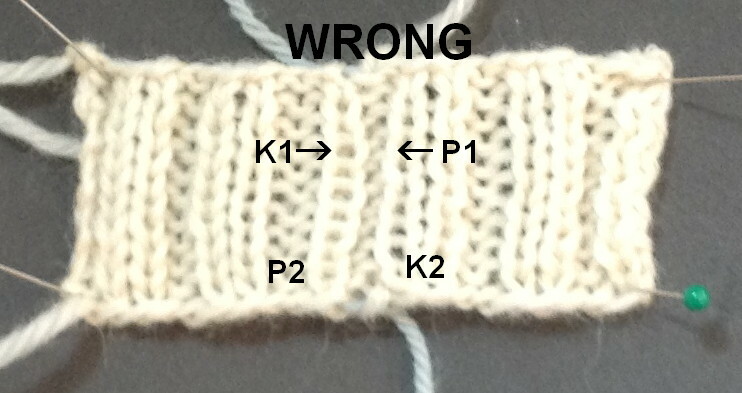 I have seen many patterns where the instructions for K2P2 ribbing is required and it is based on a multiple of four. 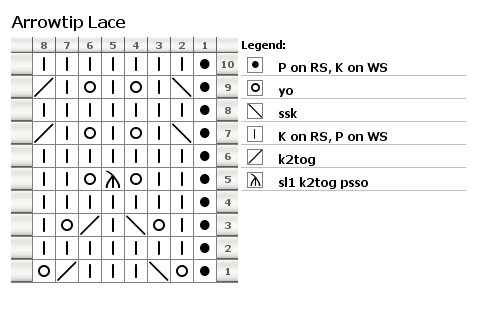 That means that the pattern K2P2 is repeated across the row. It begins with two knit stitches and ends with two purl stitches. There is no way to seam this properly. I've had knitters bring their work to me and ask how they can fix it. Once the pieces are knit, there isn't much you can do other than take it out. This photograph shows what happens when you try to see K2P2 rib configured this way. 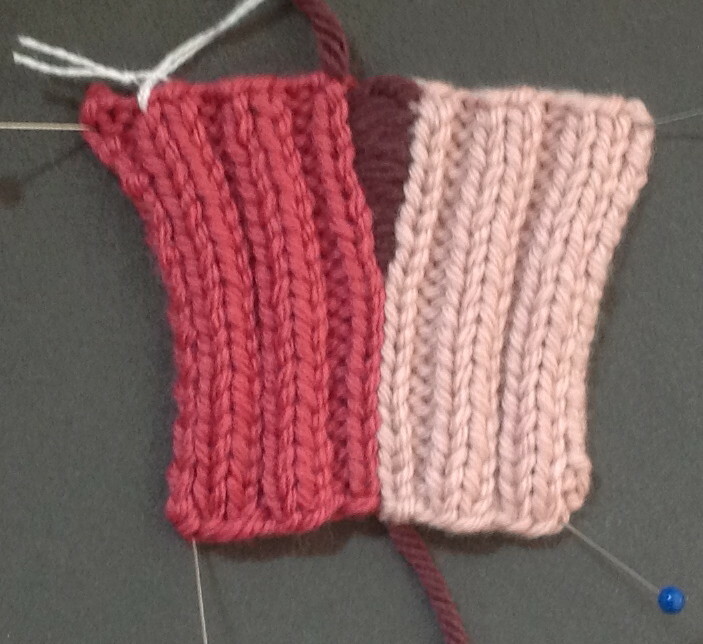 On one side of the seam you will have one purl stitch and on the other you will have one knit. This just gives the piece a "home made" look rather than "hand made." 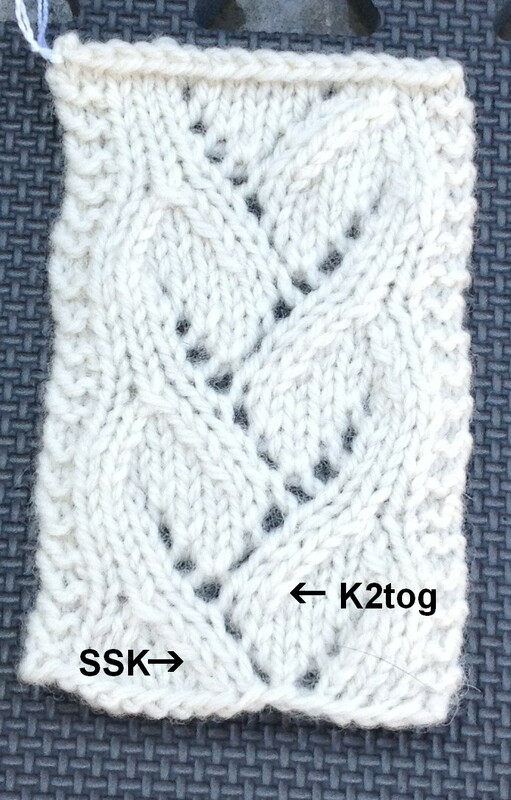 The first thing you need to do when using a pattern that has K2P2 ribbing (and will be seamed) is to check the pattern multiple. It needs to be a multiple of 4 sts PLUS 2 additional stitches. (If you look at stitch dictionaries, they frequently show the multiple and then add "plus" and a number of stitches. The "plus" numbers are what you need if you plan to work the pattern flat.) The "Plus 2" for K2P2 ribbing is needed for the seam so that the pattern can continue over the seam. What do you do with a pattern when this is the case? I generally add two stitches so that the multiple works. You can always decrease these stitches on the last row of ribbing. The knit stitch from the end of one piece lines up with the knit stitch at the beginning of the other piece. Yes, the pattern is continued but there are times this configuration may not be the best solution. Many knitters have difficulty with their tension a few stitches in from the selvedges. When these are seamed, the seam is not very attractive. Also, the two knit stitches at the seam do not have the same appearance and elasticity as the other knit stitches. Salon will be on Sunday this week as it is the final Met Simulcast. It is Handel's Julius Caesar. The production looks wonderful. It is set in the British Raj from what I can tell. Caesar wears a pith helmet. It doesn't get much better that that. I love Baroque music. My piano teacher has to force me to play something other than Bach. The men's socks and pattern are done. I redid the ribbing several times. This is K4P4 ribbing. I like it better. I don't have a sock form big enough to block them properly. I made the largest size mainly to see if two skeins (Brown Sheep Wildefoote) was enough. It was. Now I'm working on the FINAL project for the issue. What was I thinking? 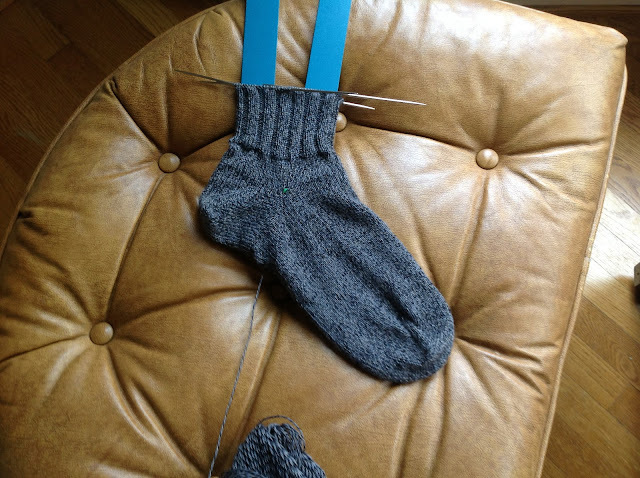 Anyway, I am using leftover Redfish to do a pair of Fair Isle socks. Although I have tons of Redfish yarn from all of the projects, I decided to limit myself to the colors in the sweater. I plan to keep these socks. I'm still working on the handout for the Design Workshop. It is shaping up nicely. 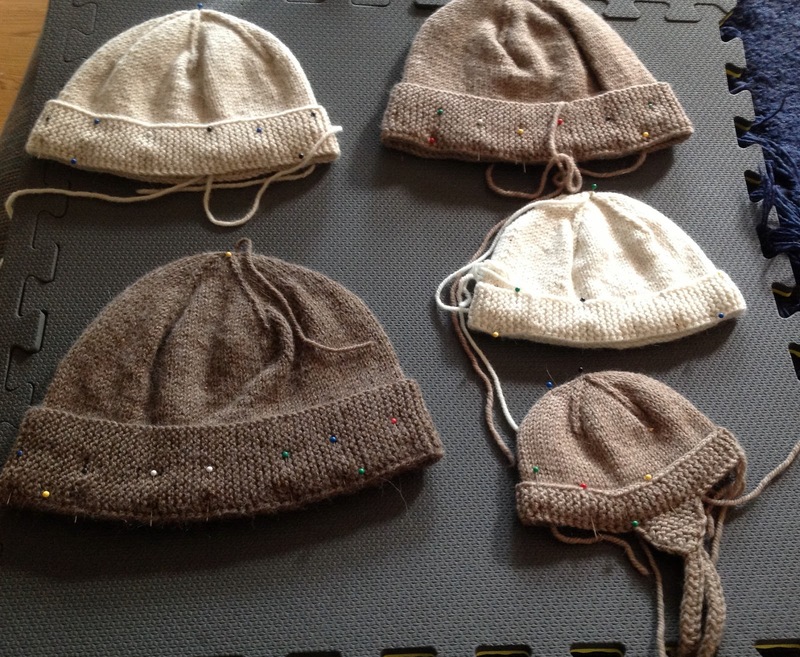 I've finished up the section on hats and now working on the mitten section. A project like this forces you to clarify your own thinking. I've learned a lot as well! Another slow week. I received just a few lessons to review. Just as well...my allergies are really making me stupid. EVERYTHING is blooming this week. It is beautiful but hard on me. I've noticed in past years that after Tax Day, things pick up . This week the topic is how to seam ribbing. The technique you use is the mattress stitch but the important thing about seaming ribbing is to make sure that the K1P1 stitch pattern is maintained over the seam. I would like to say designers take this into account in their patterns but I am afraid that is not always the case. 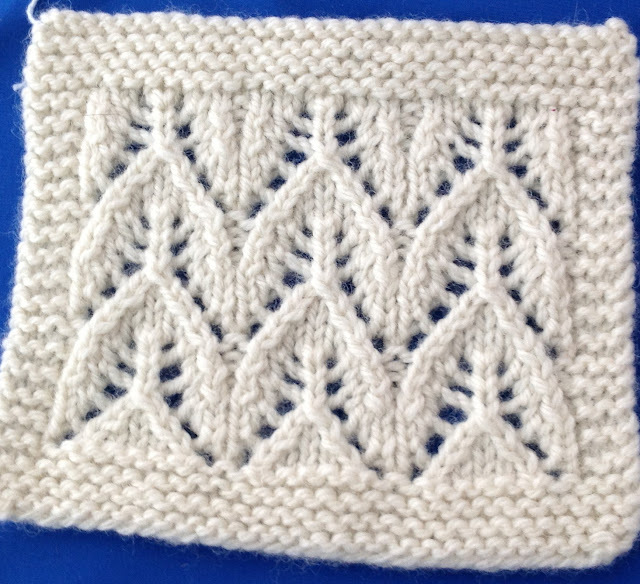 The knitter must examine the pattern BEFORE casting on to make sure that it will be possible to finish the garment properly. I can't tell you the number of times someone has brought garment pieces to me wanting help with finishing and I have to break the news to them that there will be problems doing this. 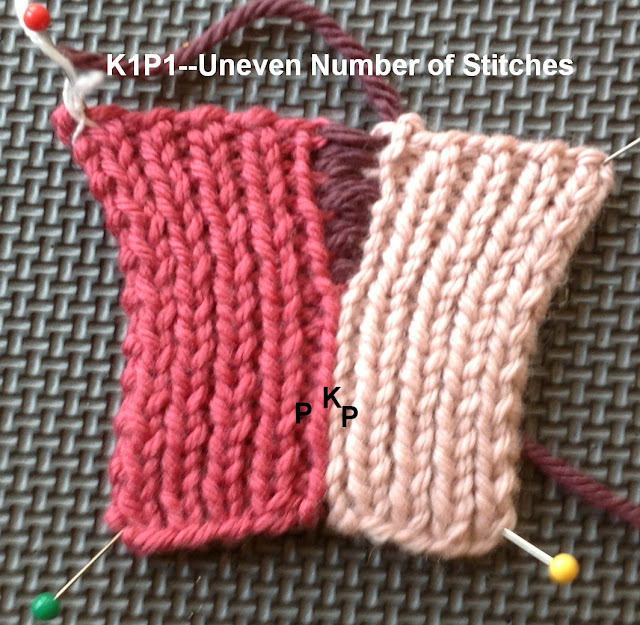 When you look at a pattern with K1P1 ribbing at the bottom of the sweater, check to see that it is an even number of stitches. If it is, you will have no problem seaming it. On both pieces (front and back) if the first stitch is a knit, the last stitch will be a purl. That means that when the pieces are seamed the pattern lines up. Remember that the mattress stitch uses the horizontal bars BETWEEN the selvedge stitch and the next stitch in (I have some photographs of this in my blog of November 30, 2012). If the pattern calls for an uneven number of stitches to be cast on for K1P1 ribbing, you can make adjustments. 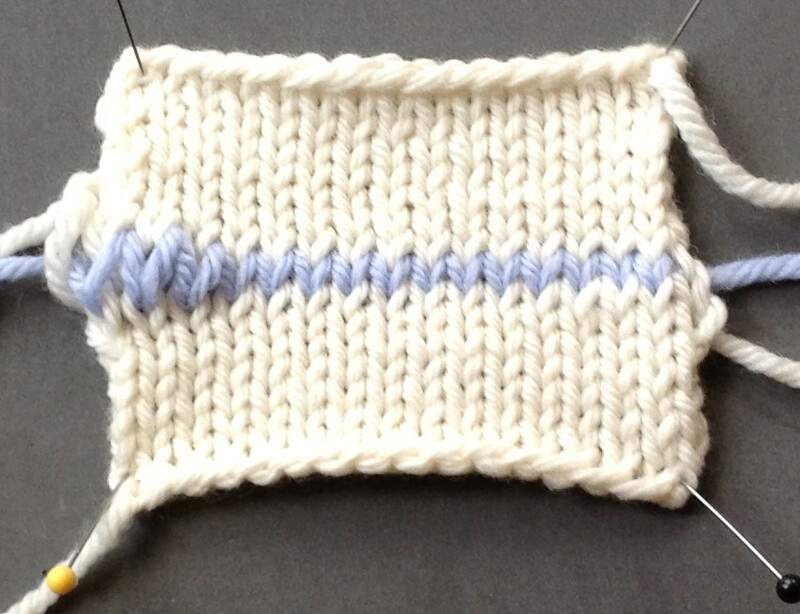 When there is an uneven number that means that the piece will begin with a knit stitch and also end with a knit stitch. 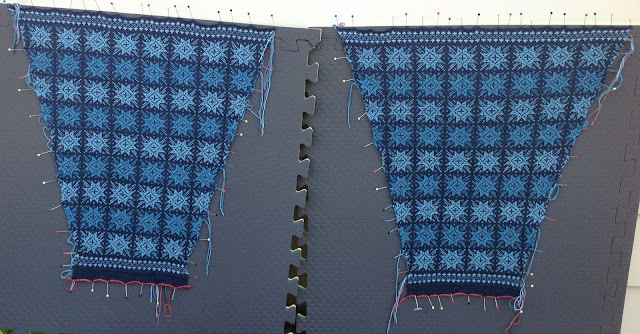 If this pattern is followed on both pieces, when you go to seam it, if you use the mattress stitch, there will be two purl stitches at the seam line. There are several solutions. The easiest is to adjust the stitches. 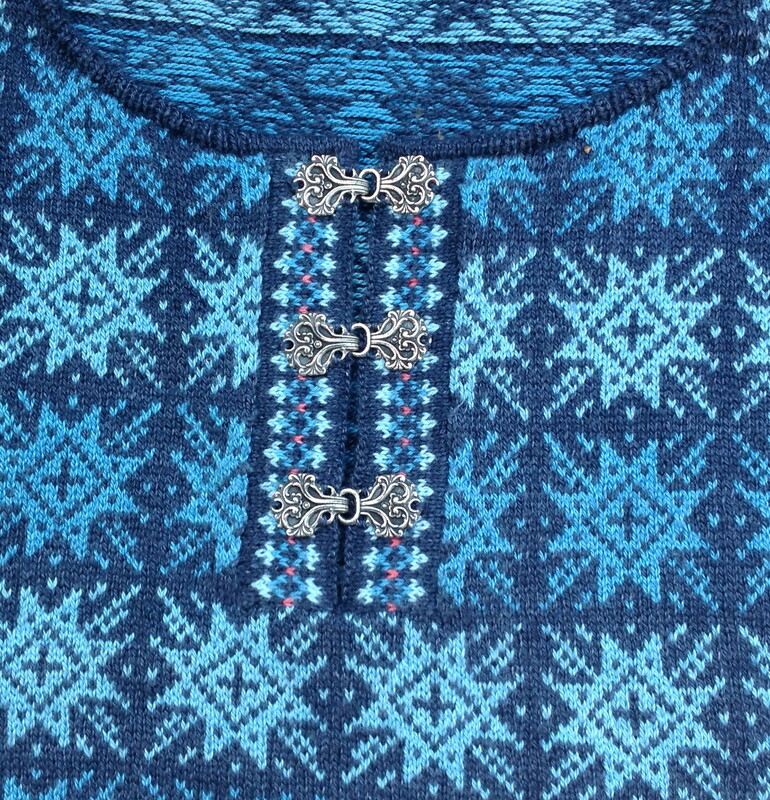 For example, on the back you can begin with a knit stitch. When you knit the back, begin with a purl stitch. The pattern will line up. 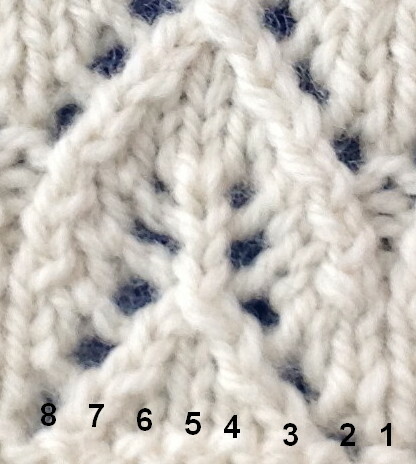 Another thing you can do is add another stitch so that you have an even number. 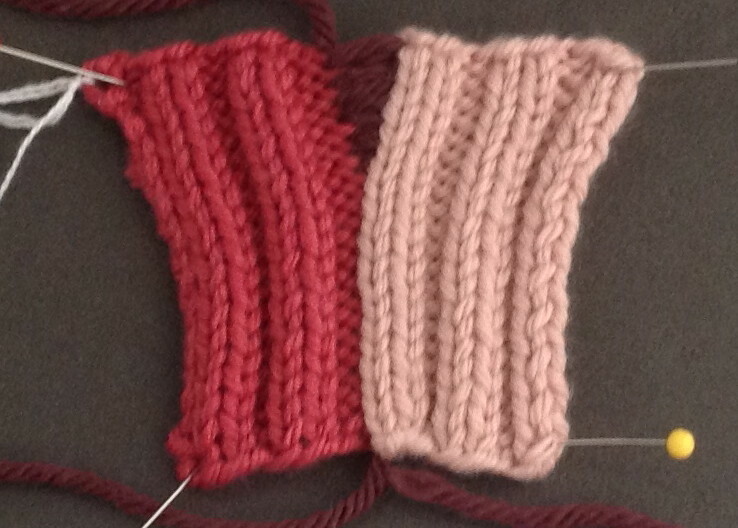 You can decreases a stitch after the ribbing. Unfortunately most knitters notice this after the piece is knit. There isn't much you can do at that point other than work with what you have. You can place the seam IN the selvedge stitch. 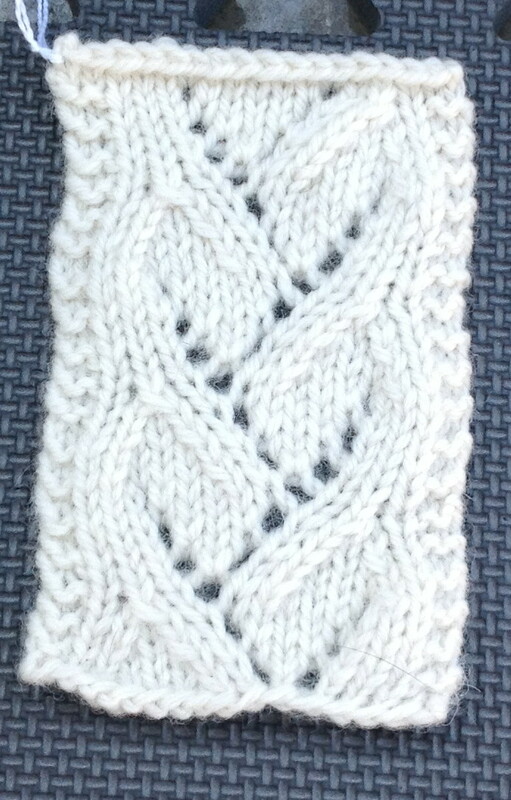 This leaves half a stockinette stitch on either side of the seam. The problem with this method is that selvedge stitches are pretty ugly so the half stitches don't quite look like the surrounding stitch. It is better than nothing, however. You can see in this photograph that this seam is not as attractive as the seam in the other sample. 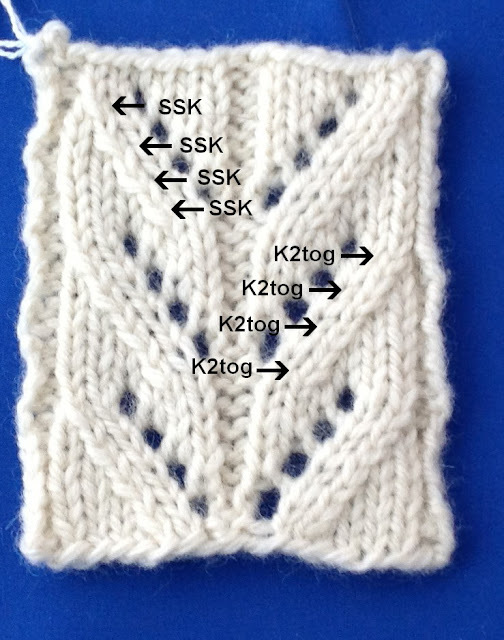 Next week the topic will be seaming K2P2 ribbing. Salon this week will be on Sunday from 2-5 pm. I'll be driving up to the airport in Cincinnati very early in the morning. I hope I'll still be awake! I finished up the hats, or so I thought. Check the photo to see if you can see what I did wrong. I finished the matching scarf as well. I haven't bothered to weave in yarn tails yet. I was so confident that I remembered how I knit the other sizes, that I didn't bother to check my numbers before starting on the smallest size (the ones with the earflaps.) There is a 10 stitch difference between the sizes but between the white hat and the one with earflaps there is a 20 stitch difference. I plan to knit another hat to fill in this gap. I simply can not let it go. The good news is, that these hats take no time at all to knit. 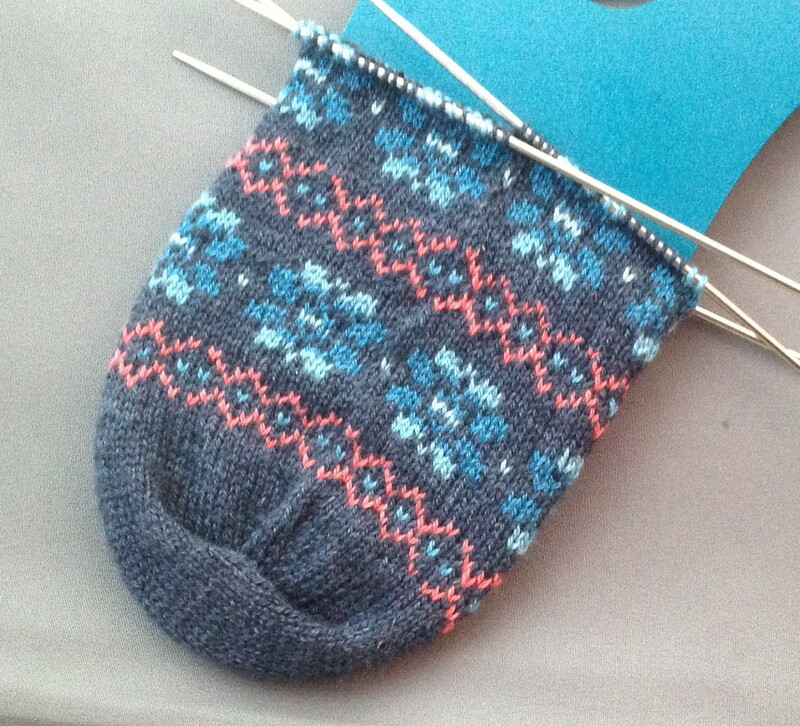 As soon as I finish the Man's sock pattern & sample, I will do the hat. The scarf didn't take much time to knit. It, obviously, is very easy. Yes, these are boring socks. That is the whole point. The issue will feature knitting for men. After an exhaustive survey we have discovered that MOST men (there are exceptions) want REALLY BORING knitted garments (which is why I rarely knit for my husband). 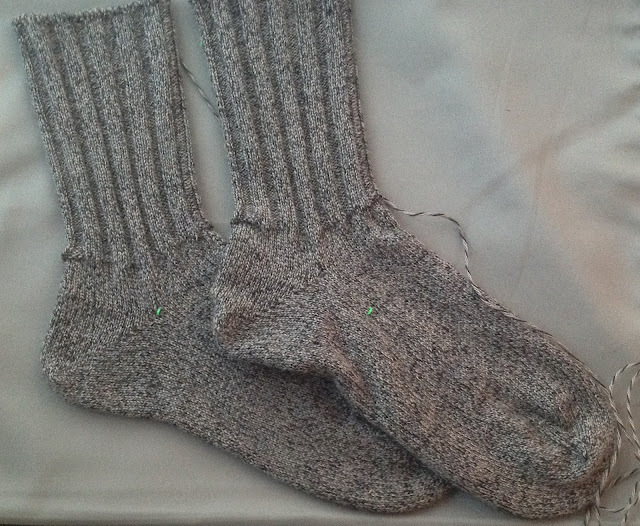 These will be boot socks. The sock form I have is for Woman's Large. The socks are Man's Large so they dwarf the form. I am making them in my husband's size, just in case. I finally finished the sweater. Its official name is Summer Nights on the North Fork of the Duchesne River. It took so long to do the finishing but I didn't hurry it. That is a mistake many knitters make....rush the finishing. I am very pleased with it. The pattern took a day to write. The chart for the fish was particularly challenging. I ultimately decided to chart the whole thing as doing multiples for the fish would be very confusing. I'm still plugging away on the Design Class for Mackinac. My policy for my handouts is that they include everything I say in class so that they can be used as a reference later. This takes some time. The students will design a hat, a mitten and a simple sweater. It takes some time to present the key information you need to be able to do that! I reviewed several lessons this week. I am starting to get more lessons from the new courses which is exciting as the work is so good. I am particularly happy about the Finishing Class. When I was on the Masters Committee as a reviewer and Co-chair, I notice that those doing the Masters Program had the most difficulty with the finishing swatches. It is not unusual for most of them to be resubmitted. I think the reviewers will be happy with the work submitted from my students. I'm going back to finishing tips this week. I heard from one of my students that she was having difficulty with the Kitchener swatch so I did a video for it. 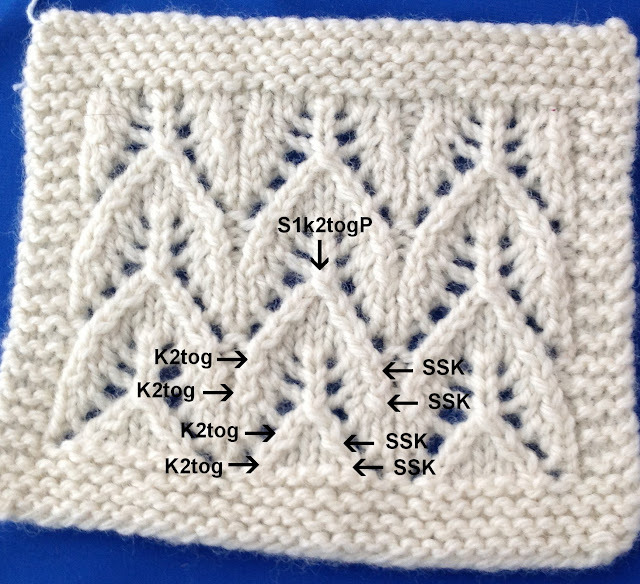 There are many, many references for how to do the Kitchener stitch. The trick is to find a technique that makes sense to you. Some of the references I've seen suggest taking the live stitches off the needle. Yes, it does make the orientation of the stitches easier to see but this makes me nervous. I prefer the method I first learned. I think it was from Vogue Knitting. The first thing to remember is that when you are doing the Kitchener stitch, you are NOT knitting. You are sewing. It doesn't matter where the working yarn is or if the next row would be a RS or WS row. I generally transfer the stitches from whatever needles I used to knit the pieces to DPNS. You then position the needles together so that the RS are facing out and the WS are together. One needle is on the top (needle 1) and one needle is on the bottom (needle 2). You can see this in the video. Kitchener Video . Thread up a tapestry needle and insert it into the first stitch on Needle 1 as if you were going to purl the stitch. Pull the yarn through. Insert the tapestry needle into the first stitch on Needle 2 as if you were going to knit the stitch. Pull the yarn through. These are the preliminary steps. Once you have taken care of the selvedge stitches you are ready to do the rest of the stitches. Insert the tapestry needle into the first stitch on Needle 1 as if to knit. Pull the yarn through. Drop this stitch from the needle. Insert the tapestry needle into the next stitch on Needle 1 as if to purl. Pull the yarn through. Insert the tapestry needle into the first stitch on Needle 2 as if to purl. Pull the yarn through. Drop this stitch from the needle. Insert the tapestry needle into the next stitch on Needle 2 as if to knit. Pull the yarn through. You just repeat this until all of the stitches are worked. The "shorthand" for this is: Knit, Drop Purl. Purl, Drop, Knit. Insert the tapestry needle into the last stitch on Needle 1 as if you were going to knit the stitch. Pull the yarn through. Insert the tapestry needle into the last stitch on Needle 2 as if you were going to purl it. Pull the yarn through. The final step is to clean up the stitches. 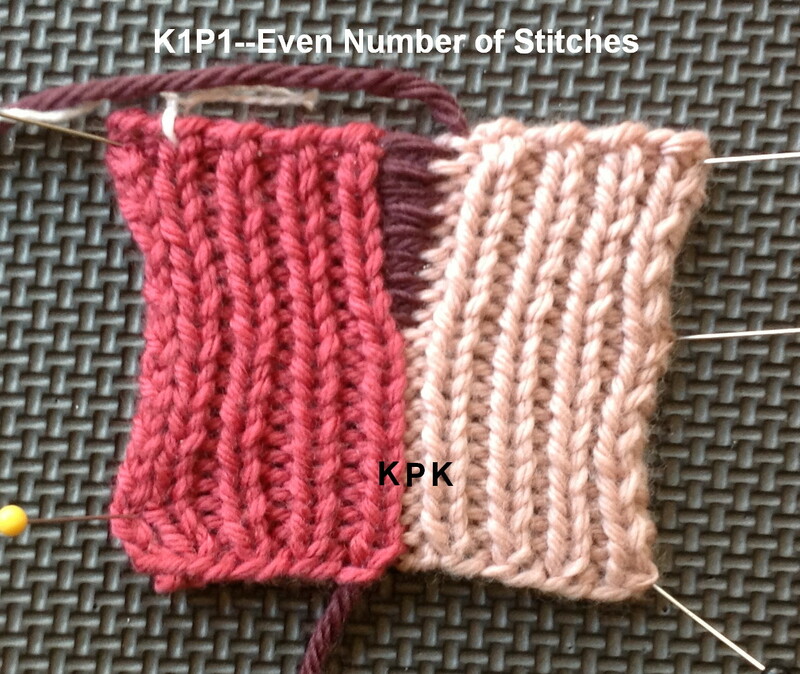 Use your tapestry needle to pull excess yarn from the Kitchener stitches so that they match the surrounding stitches. What can go wrong? You must have the same number of stitches on each piece. If you get off from the Knit, Drop, Purl, Purl, Drop, Knit rhythm you can wind up with purl bumps. My recommendation is to allow yourself enough time to finish the entire seam. Don't watch television, talk on the phone or do anything that can distract you. Salon will be on Saturday from 1:30-3:20. 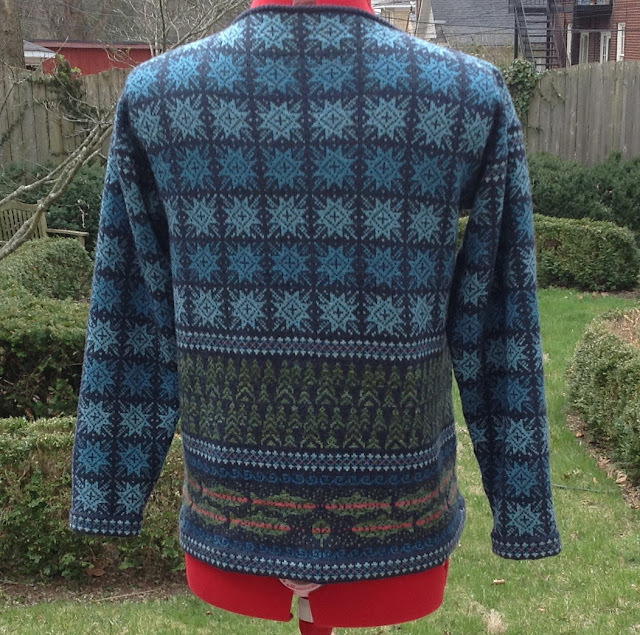 Here are the final photos of the sweater. I love how the neckline worked out with the clasps. I really took my time with the finishing to make sure it was perfect. Finishing anything knit on Size 0 needles in navy yarn isn't easy! I still have some things to do for the next issue of Cast On. A comment we hear frequently is that we need some easy designs. Since the issue will focus on designs for men, I decided to combine the two. After my husband (who never wants anything I've knit) snagged a hat I was knitting for myself, I thought it would make a nice design for this issue. Since I don't have an off switch I decided to do samples for all of the sizes since Berroco Ultra Alpaca comes in such nice colorways. 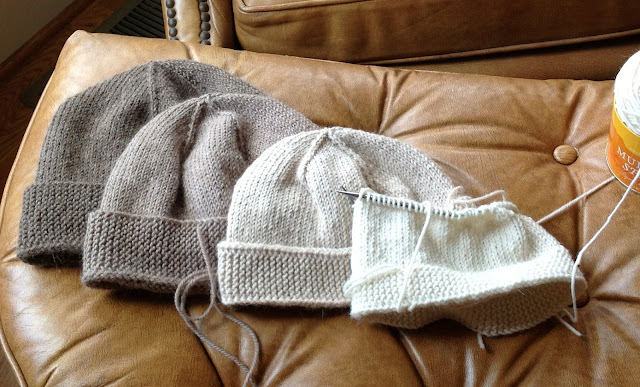 After working on Size 0 needles, this hats have gone very fast. I'll block them when they are all done. 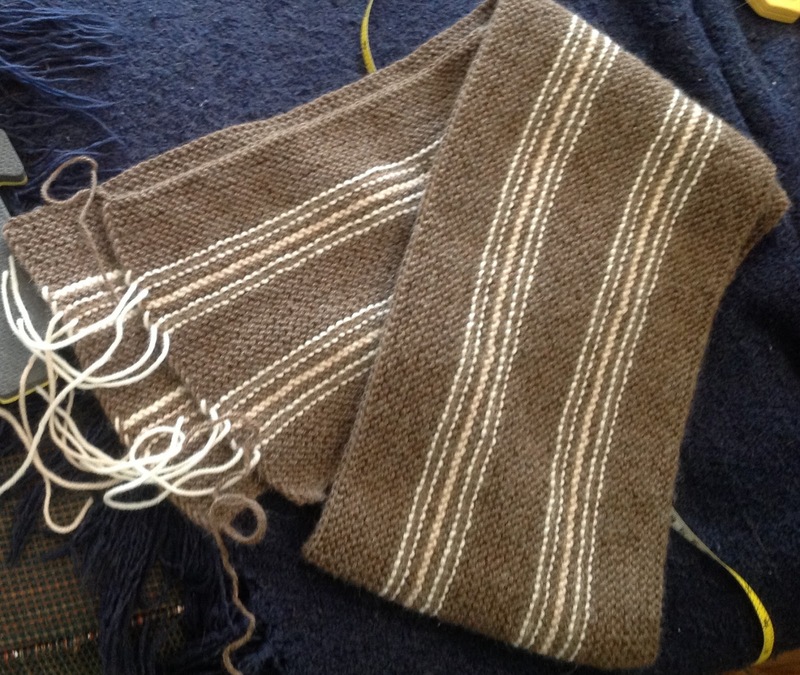 I'm doing a garter stitch scarf to match. Nothing easier than that! I was determined to finish the knitting on the stranded sweater and I succeeded. All I have to do now is seam it which won't be easy. The background color is navy. I spent the better part of the week working on the workshop for the Mackinac meeting. Registration is open until April 19th and there is still room. There seemed to be a misunderstanding about who should take this workshop. You do not have to be an experienced knitter. The basic design process really only requires an understanding of gauge (which we will do in class) and how to shape garments (an understanding of increases and decreases). I've already heard from students about the homework. There won't be much....just a couple of simple swatches we will use to work on gauge. I have a theory that many people are working on their taxes in late March. As soon as they have filed, they start working on other things...like their knitting. I've seen an upswing in the number of lessons to review and new course orders. It is definitely more fun to knit than work on taxes! 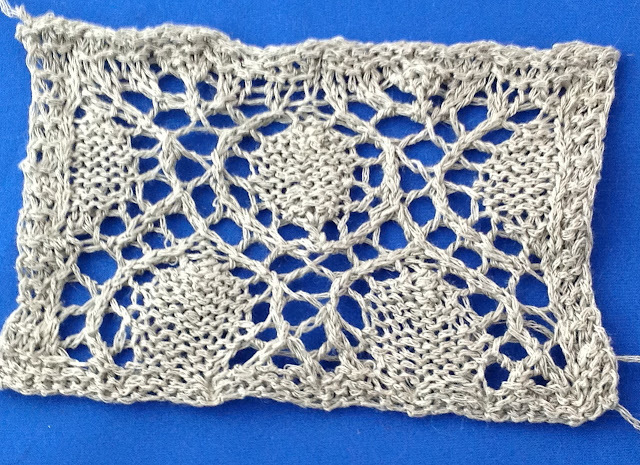 I used this pattern for a 90" long shawl and I never quite could memorize the 24 row repeat of the pattern. 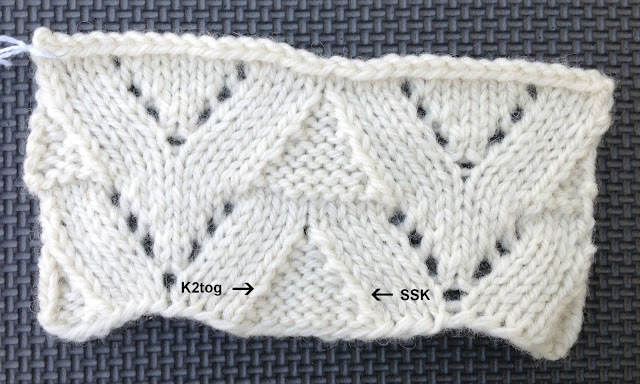 In complicated lace patterns like this one, the number of stitches can change from row to row and there aren't plain rows on the WS. You are making decreases on every row. For simpler patterns it isn't that hard. This is the actual pattern I was using on that pair of socks. 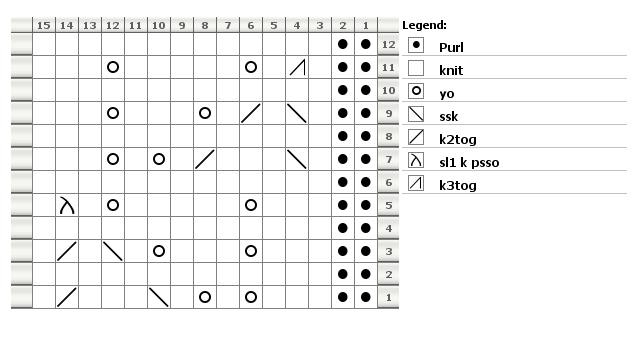 The first thing is to figure out the number of stitches in the repeat. 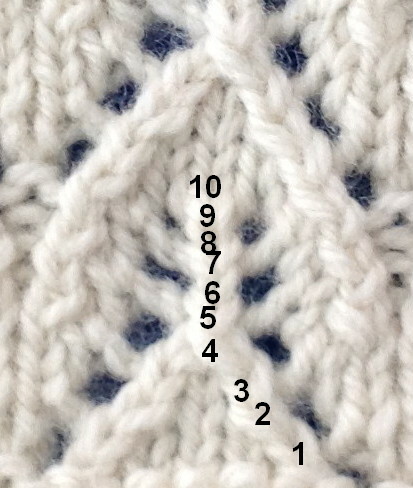 There are 8 stitches in the pattern repeat. Remember when you are counting stitches that the decrease counts as one stitch and the matching yarnover counts as one. The first stitch is hard to see since it is a purl stitch which separates each column of motifs. The next step is to figure out the number of rows. 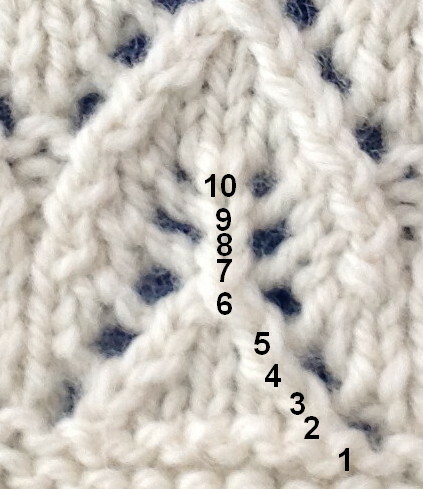 Remember where you see the decrease (two stitches overlapping) is actually the row before the decrease. The pattern repeats after Row 10. 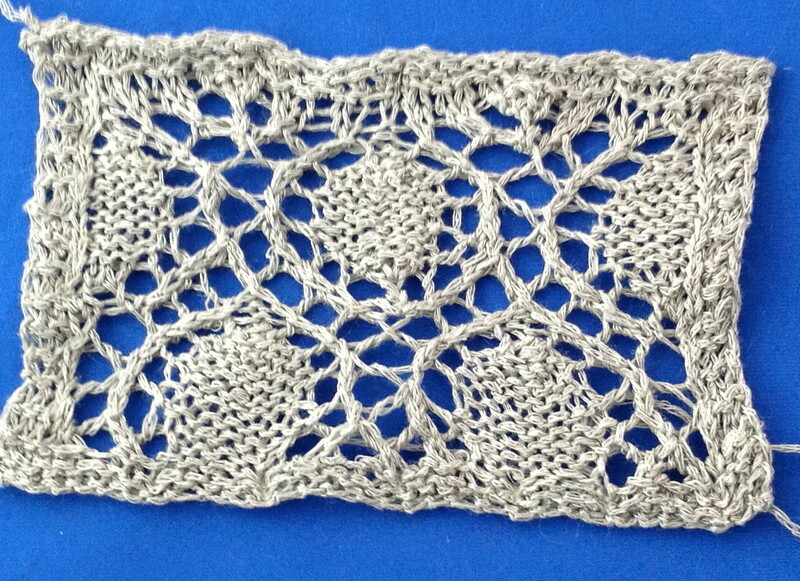 Here are a few lace swatches. See if you can figure out what decreases are used and if you can decipher the pattern. Salon will be on Sunday from 2-5pm. I will be driving up to the Cincinnati airport on Saturday. I am happy to be putting the finishing touches on this sweater. While the sleeves were blocking, I seamed the shoulders and did the neck treatment. I was worried that the clasps would never arrive but they did. It was difficult to find clasps small enough for this sweater. I am pleased with how the front turned out. This type of neckline is a bit tricky. The borders are faced. You have to be very careful that both sides match perfectly when you are dealing with such geometric patterns. It can look really tacky if you don't. The stitches on the neckline are K1P1. The edge is then folded over and basted in place. I had thought of doing the border around the neck but I decided it was too much. 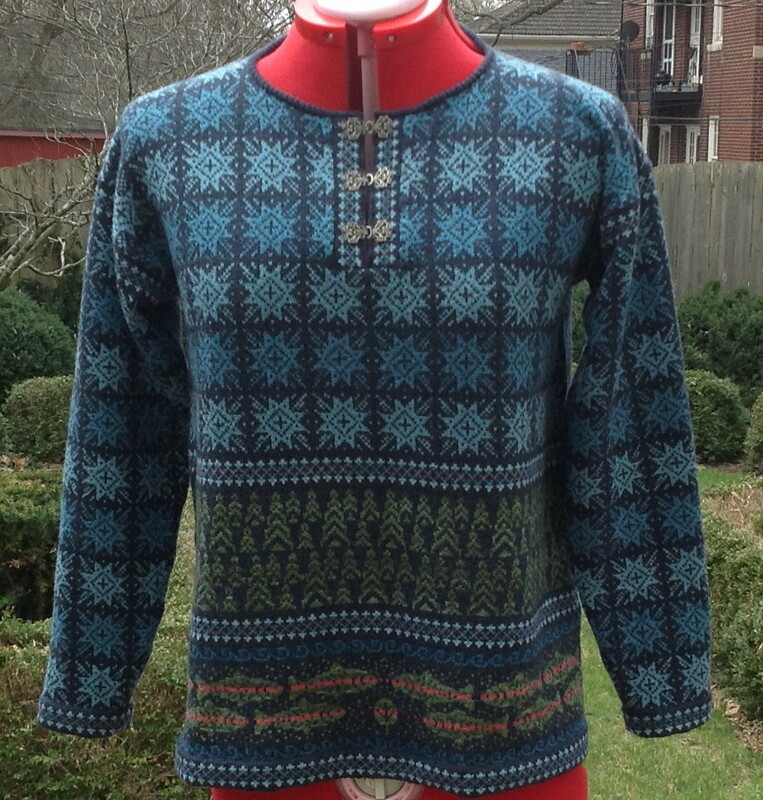 Next week I will post a photo of the completed sweater. It will take me several days to seam the sleeves and sides. This is where you have to be careful not to cut corners. Here are the sleeves. If you notice, there is waste yarn at the cuffs. I did a provisional cast on which I will graft in place as the final touch.